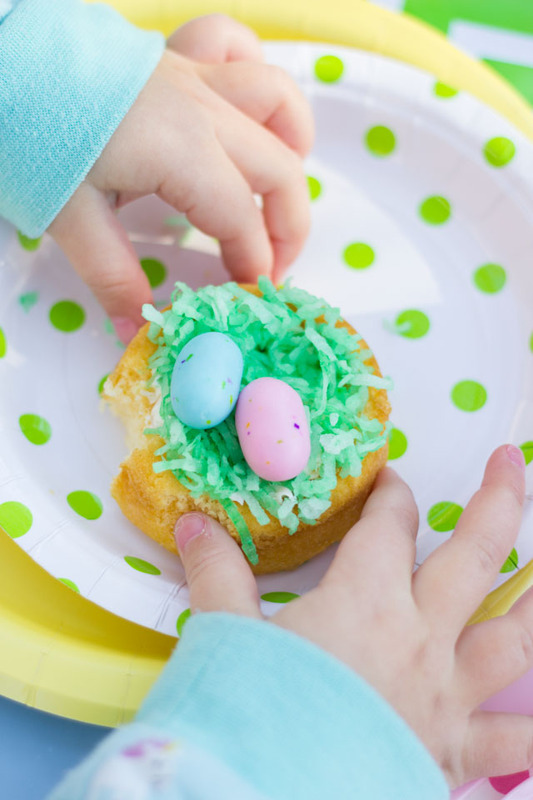 7 Fun Ideas for a Kids Easter Party! 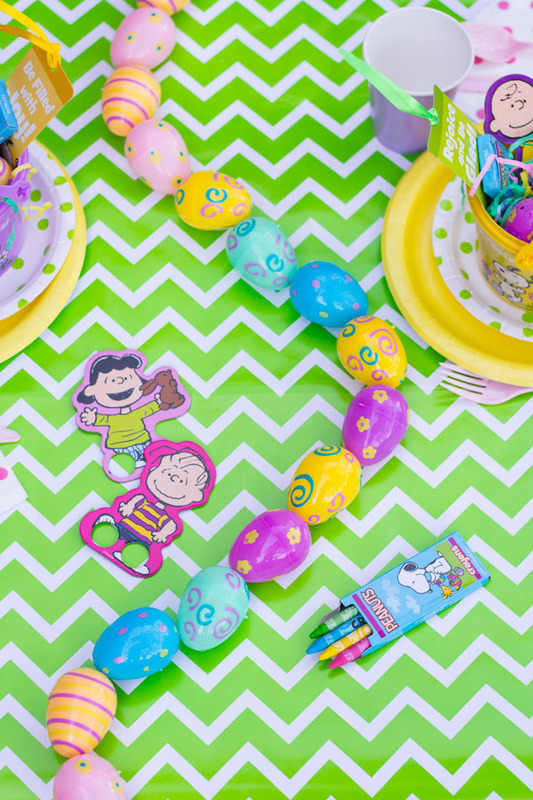 I had the chance to create the sweetest kids Easter party featuring decorations from Oriental Trading, including their exclusive line of Peanuts® party decor. 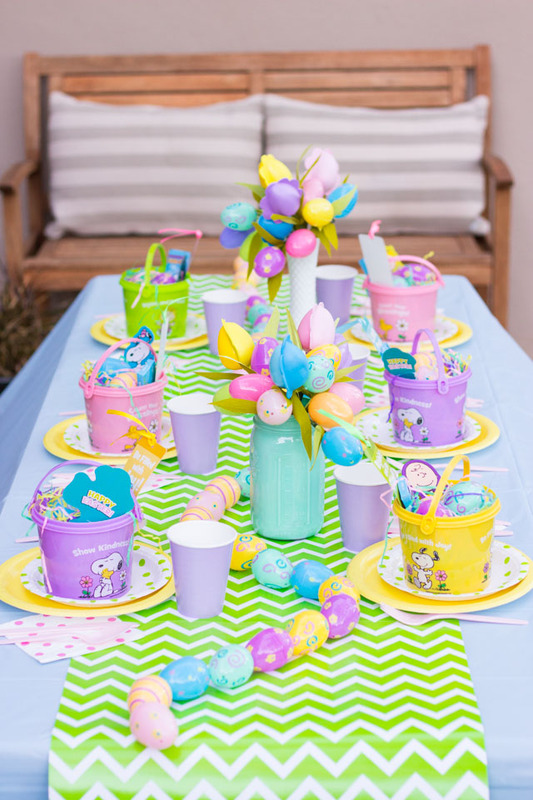 Read on for my 7 tips for creating your own Easter party that kids will love! 1. Pick a theme – whether it is Easter bunnies, or an egg hunt, or spring flowers, having a theme for the decor helps pull it all together. These cute decorations featuring Snoopy and the other Peanuts® characters were a fun kid-friendly theme for the party. 2. Hold it outdoors – if the weather allows, have the party in the backyard! We decorated our picnic table and had the party on a sunny morning. Having it outdoors keeps your decorating to a minimum and helps avoid a big clean-up indoors! 3. Make it colorful – rather than stick with a single color, I used a mix of pastel plates, cups, and napkins from Oriental Trading. I also incorporated different prints like polka dots and a lime green chevron table runner. 4. 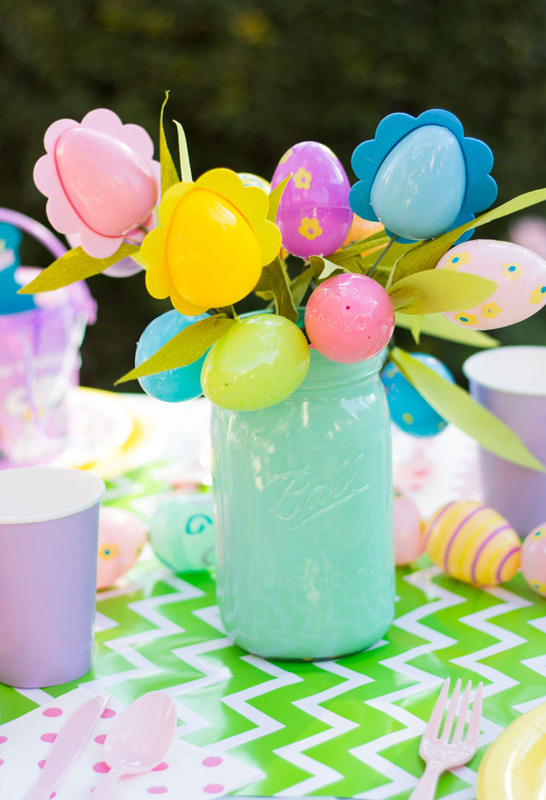 Keep decorations easy – inexpensive plastic eggs were the star of the decor. I made Easter egg flower centerpieces (see tutorial here!) and strung the eggs together with string to make a runner down the table. 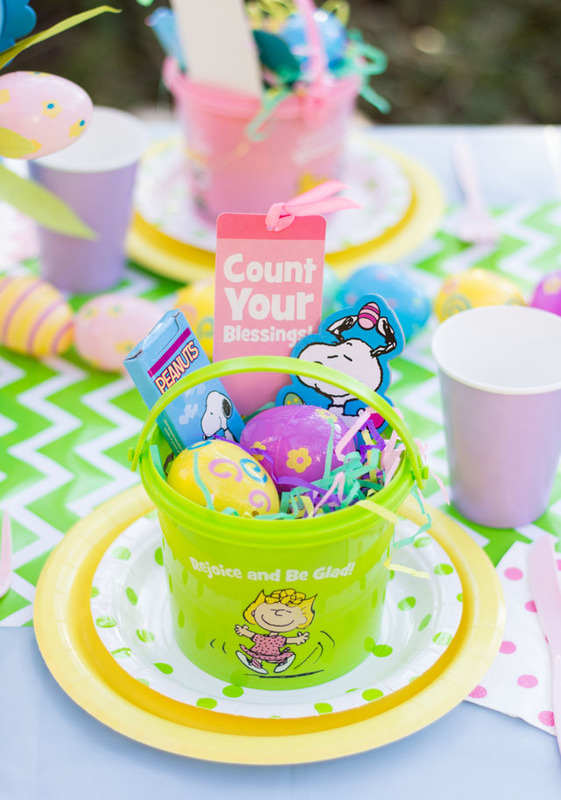 Little Peanuts® pails filled with goodies at each place setting doubled as both decor and party favors. 5. Incorporate a fun craft – kids love making things as long as you keep it easy! 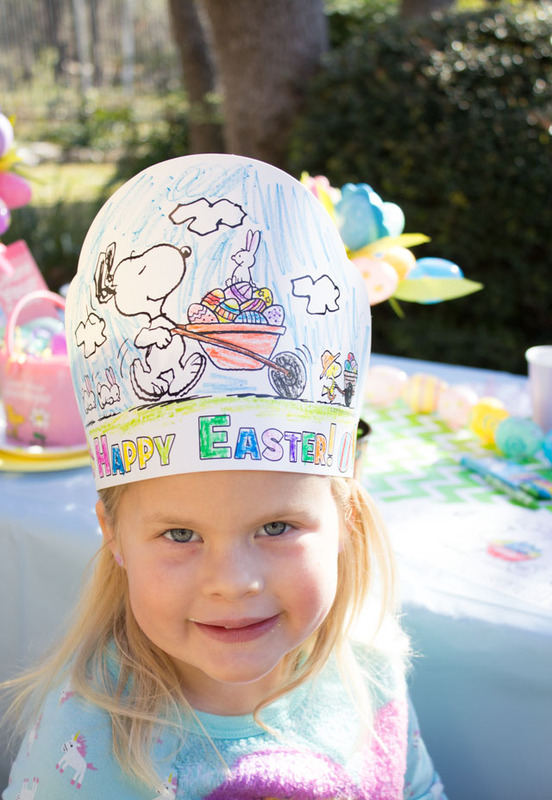 The kids loved coloring their own Peanuts® party crowns. 6. Serve a yummy treat – skip the fancy layered cake and opt for easy finger foods. You can make these Easter egg nest cakes in minutes from store bought ingredients. Here’s the recipe! 7. Get them moving! – take advantage of being outdoors by doing an Easter egg hunt and playing games. We had Peanuts® Easter kites for the kids to fly (and take home with them afterwards)! Head to Oriental Trading for links to all the party supplies, the Easter egg flower bouquets tutorial, and the Easter egg nest cakes recipe!